When it comes to notable architecture in Texas, it would seem strange to place San Antonio on par with Houston or Dallas. As the second-largest city in the state, San Antonio seems to only mimic the kind of architectural largesse seen in those cities. There are plenty of jewel-like late modern skyscrapers and austere civic buildings by Skidmore, Owings and Merrill, Caudill Rowlett Scott, and Marmon Mok in the city, but these are not the kinds of projects one would mention in the same breath as Houston landmarks like Johnson/Burgee’s Pennzoil Place and Williams Tower, Renzo Piano’s sublime Menil Collection, or Fort Worth’s iconic Kimbell Art Museum by Louis Kahn. A selective itinerary of San Antonio’s past and future architectural projects reveals a steady commitment to buildings with bold, expressive forms that reference the city’s unique environment, history, and culture. Alamo City warmed up to these compelling architectural additions as it expanded during the late 1940s and early ’50s, and became a home to energy and utility companies during the 1970s and ’80s. Funded by philanthropic organizations and influxes of oil cash, many of these buildings are now hidden by giant, swooping highway overpasses, corporate plazas, and other developer-driven projects. Despite the earlier innovative and controversial projects, San Antonio remains overlooked. This will soon change. Newly appointed mayor Ronald Nirenberg has re-energized discussions about creating new housing, battling gentrification, and committing to more public art. This will certainly place a spotlight on San Antonio’s rich architectural offerings while reminding us of how these and other past projects have embodied this city’s distinctive topography, Latino heritage, and dry, arid environment. 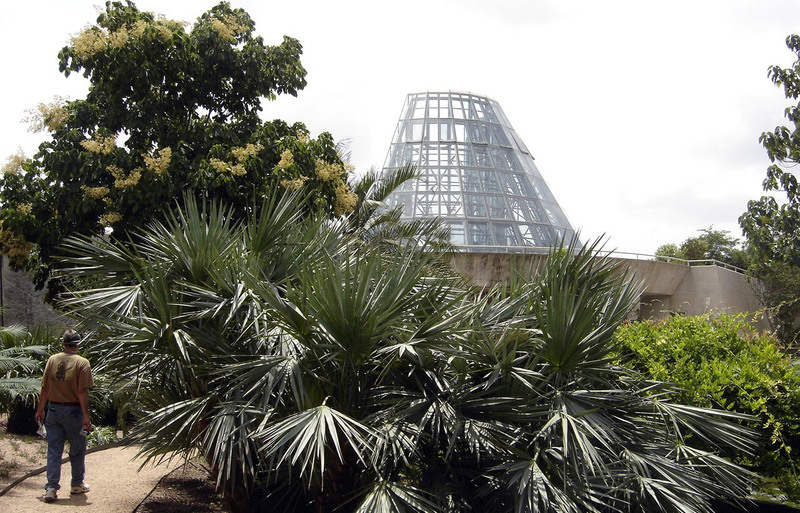 Emilio Ambasz’s Lucile Halsell Conservatory, completed in 1988 at the San Antonio Botanical Gardens, is a good starting point. Located on the city’s northeast side, Ambasz’s scheme took advantage of the sunken site with a series of prismlike canopies that appear to rise out of the bermed earth like upturned shards of glass. Each canopy creates its own kind of climate and features particular plant ecologies—architecture designed, as Paul Goldberger observed in 1987, for the interaction between plants and humans. The project is notable for its combination of building, landscape, and infrastructure into a seamless whole. The Lucile Halsell Conservatory accommodated some very particular environmental and topographical conditions, and did so with a formal and technological expressiveness unlike anything that had been built in San Antonio. 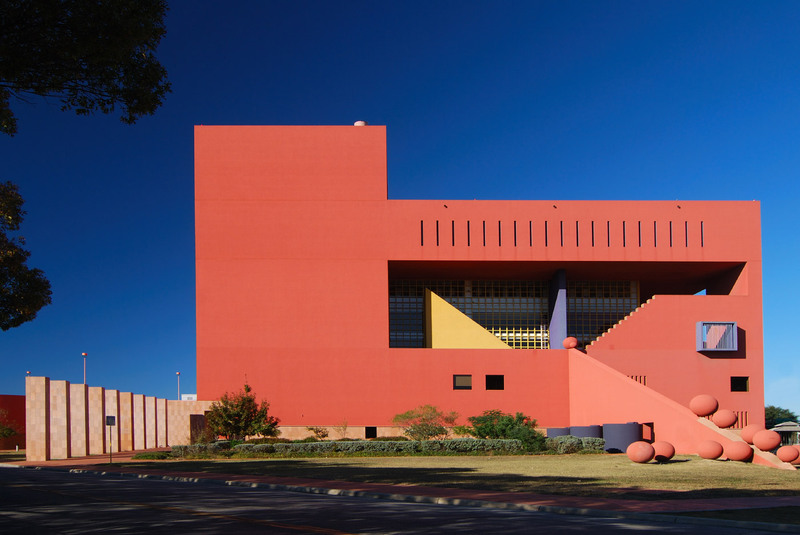 Mexican architect Ricardo Legorreta’s San Antonio Central Library, completed in 1995, continues in this vein. Here, cubic volumes are stacked at various angles, creating a series of triangular-shaped courtyards intended to be outdoor reading rooms. Legorreta’s debt to Mexican architect Luis Barragán’s minimalist polychromy is clear. Working with the painter Mathias Goéritz, Barragán created spaces framed by walls and surfaces doused in highly saturated reds, blues, yellows, oranges, magentas, and pinks. At his Central Library, Legorreta appears to invert Barragán with a simple, playful interplay of volumes that seem to be wrought from its own color palette as well. The reddish-brown colored cubes appear gutted in some places, revealing inner planes of yellow, blue, and purple. When viewed from the air, the Central Library appears otherworldly, framing circular plazas made from grass and limestone and located on a triangular-shaped site near the geographical center of the city, as if something from another time had arrived here. That a Mexican architect was chosen for this project is important. As the seventh-largest city in the United States, San Antonio has one of the biggest Spanish-speaking populations. Over 62 percent of its residents are of Latino origin. The appeal of Legorreta’s Central Library stemmed as much from the need for more public libraries as it did from the desire to reflect the city’s heritage. Though this was the first building in San Antonio designed specifically to reflect the city’s Mexican-American heritage, there are older buildings that expressed the cultural richness so important to the city. The Alamo and the four Spanish Missions (recently designated as UNESCO World Heritage Sites) all combine Spanish and Catholic influences while referring to the rituals and structures of indigenous peoples. This is to say that San Antonio’s architecture continues to find a way to embody its venerable cultural geography. It also incorporates its distinct environmental geography. San Antonio is a city hewn from mesquite-dappled hills, limestone quarries, and deep-set aquifers. Lake|Flato continues to be the standard-bearer among the city’s firms for a kind of tectonic and environmental sensitivity that is immediately recognizable for its ingenious references to these conditions. Imagine a version of John Lautner’s spacious geometric forms where large cornices made from corrugated metal peer over meticulous compositions of glass, limestone, slats, and brise-soleil made from local woods, all culminating in views that privilege the rolling, arid mesquite and persimmon landscapes of the Texas Hill Country. This would not do justice to Lake|Flato’s work, but perhaps it is as close as we can get to a kind of South Texas regionalism. Yet some of Lake|Flato’s current work points to something altogether different. 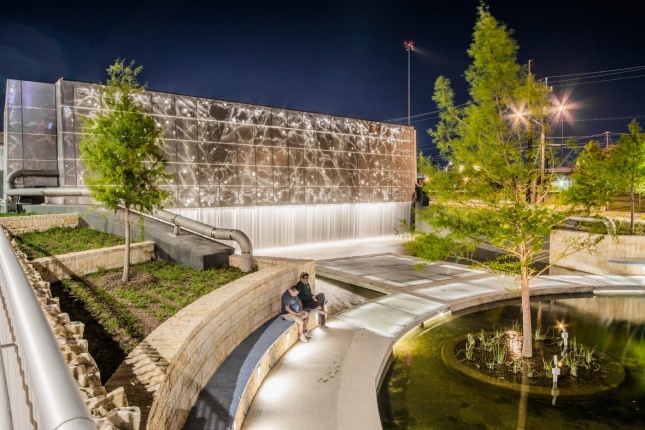 Their recently completed pavilion at Confluence Park designed in collaboration with Matsys connects the joining of the San Antonio River and San Pedro Creek, to nearby Mission Concepción, an 18th-century basilica. This is a highly-charged site in predominantly Spanish-speaking South San Antonio. The most visually arresting parts of Lake|Flato’s project are the concrete “petals” that reference the local flora while reminding the most architecturally astute observer of Spanish-born Mexican engineer Felix Candela’s sweeping hyperboloid structures, like Los Manantiales Restaurant (1958) in Mexico City’s Xochimilco Park, or the Chapel Lomas de Cuernavaca (also 1958) in Cuernavaca. Confluence Park is also part of the larger San Pedro Creek Cultural Park. This scheme is projected to transform a once-neglected 2.2-mile-long drainage spur into a cultural attraction with water features, public art, and areas dedicated to the preservation of local grasses and wildlife. In a nod to its aspirations, lead architect Henry R. Muñoz and others have embraced this project’s more common nickname—the “Latino High Line”—which may say more about Diller Scofidio + Renfro/Field Operation’s celebrated scheme than the actual goal of the project, which is to create a version of the Riverwalk devoid of its tourist traffic while celebrating Latino heritage. Other schemes, though funded by corporate dollars and serious placemaking advocacy firms, are barely more pragmatic in their approach. 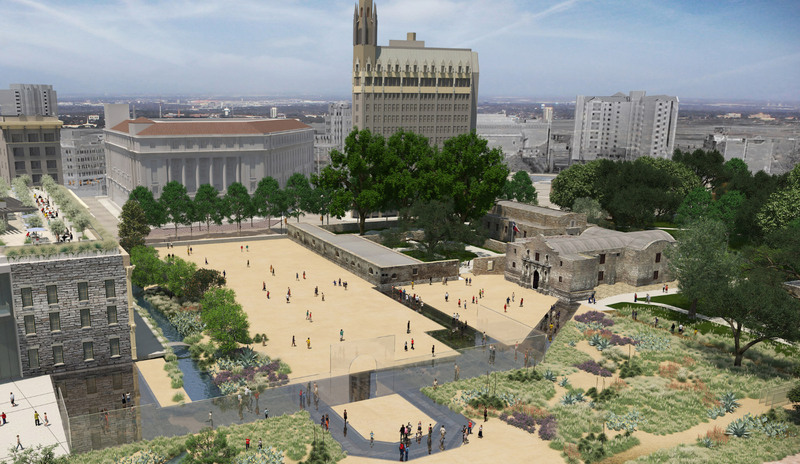 A case in point is the proposed Alamo Plaza Redevelopment. Philadelphia-based Preservation Design Partnership authored one of the first master plans, a scheme that caused controversy when it called for relocating many of the businesses surrounding the Alamo and converting them to privately run cultural attractions. Current versions of the plan have done little to improve on the previous proposal. For example, the recent Alamo Comprehensive Interpretive Plan—spearheaded by St. Louis–based “placemaking” firm Peckham Guyton Albers & Viets; the heritage consulting firm Cultural Innovations; and landscape architects Reed Hilderbrand—still hinges on the creation of a pedestrian-friendly “Alamo District” designed to turn this historically charged site into an open-air museum. A previous scheme took this idea a step further by encircling the Alamo with a glass wall, as if preserving this architectural artifact in a kind of amber. There are plenty of other projects that are reenergizing the architectural scene in San Antonio. The city is in a bit of a gut-rehab frenzy, as landmarks like the Pearl and Lone Star Breweries have been renovated as pricey hotels and higher-end restaurants, all with the end goal of molding San Antonio into a destination for design-savvy millennials with money to burn, in hopes they will ditch an Airbnb in the picturesque King William District in favor of the Hotel Emma’s posh industrial-chic. It is in this milieu that Adjaye Associates’ Ruby City arrives as one of the most exciting projects to break ground in the Alamo City. This 14,000-square-foot gallery and contemporary arts center—scheduled to open later this year near the city’s burgeoning arts district—appears as a strange hybrid, part OMA Casa da Musica, part Legorreta Central Library. 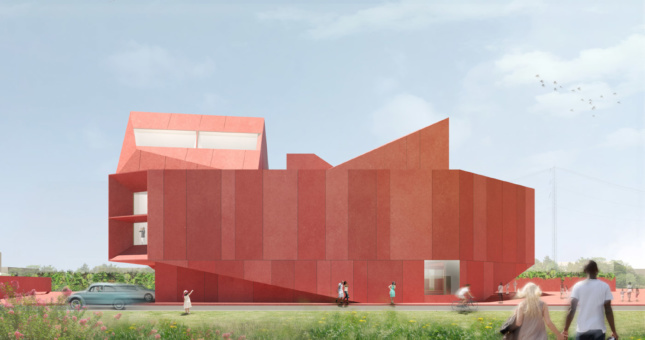 Adjaye’s building appears as a literal jewel, a faceted brick-red form whose speckled, punctured surfaces make it seem fleeting and otherworldly. But it is anything but that, for this building, which sits precariously on the edge of the one-acre CHRISpark in downtown San Antonio, will anchor the San Pedro Creek redevelopment scheme, and provide the Linda Pace Foundation’s extensive collection of modern and contemporary art with a bold, exciting home. Adjaye is still earning accolades for his groundbreaking National Museum of African American History and Culture in Washington, D.C., and with Ruby City soon to be completed, this will be the most significant architectural gesture for San Antonio—one that will hopefully inspire an influx of more commissions and projects of a similar caliber. 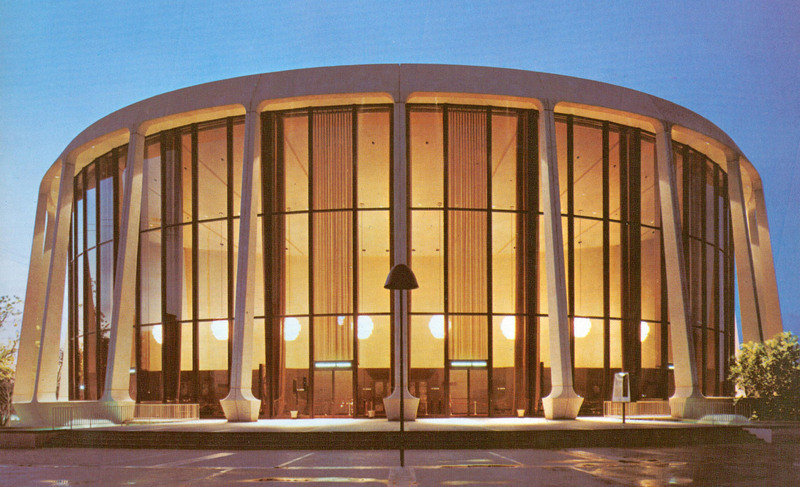 How should we look at San Antonio’s architectural legacies and gestures? It is tempting to stack them up against those in Houston or Dallas, but in doing so, we would risk ignoring how one of the fastest-growing cities in the United States is busy generating its own architectural identity. Don’t call it haphazard, however. The pace of architectural developments in San Antonio may appear slow, but like the city, its architecture is humming busily from what once was an undetectable purr to something greater. This sleepy South Texas city is anything but, and its architecture will demonstrate how this is the case.